Adriana Mnuchin, an innovator in the field of Adult Continuing Education, co-founded RoundTable Cultural Seminars and The Shakespeare Society. She began her professional career with two ‘New Concept’ retail businesses (Tennis Lady and Cashmere-Cashmere). Both became successful national business models. In 2009, Adriana co-founded RoundTable Cultural Seminars, an Adult Continuing Education organization on the Upper Eastside of NYC. The 9 to 10 seminars, moderated by Professors of the highest credentials, consist of six sessions each fall, winter and spring semesters. Some of the areas of study are Greek Studies, Literature, Film, Global Affairs, Art and Architecture, and Musical Theater. In 1997, Adriana co-founded and was Chairman of The Shakespeare Society for ten years producing five shows per year at the Danny Kaye Playhouse, NYC. This non-profit organization continues to produce Shakespearean evenings and events. In 1990, Adriana and Robert Mnuchin purchased the Mayflower Inn & Spa, a country house hotel in Washington, CT. They transformed it into a Relais & Chateaux 30-room hotel, spa and restaurant with a Shakespeare Garden and an American Poets Garden. Travel + Leisure Magazine cited Mayflower Spa as #1 in the U.S. They sold it in 2007. 1994-1998, Adriana hosted two radio shows; “Relationships”, in which she interviewed psychotherapists on specific aspects of human relationships and “Lunch at The Mayflower” (2000-2005), featuring screen stars and writers, broadcast on WRTN, covering Connecticut, Westchester and New York City. 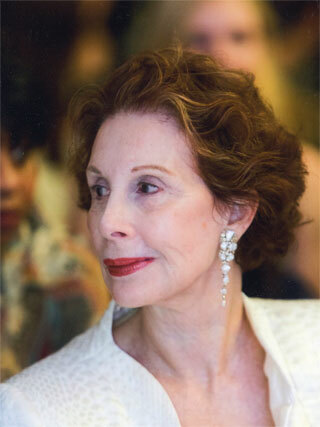 1972-1984, Adriana founded Cashmere-Cashmere in the mid 80’s and Tennis Lady in the early 70’s. These extremely successful apparel enterprises were the first of such stores in the United States. Cashmere-Cashmere consisted of 4 stores and was sold to the largest cashmere manufacturing company in the world. Tennis Lady caught the wave of tennis player popularity in the 70’s. It expanded to 21 stores across the United States and was sold in the 80s.